It’s a particularly fun time to shop for fruits and vegetables in Ontario. For a short period, there is an abundance of lovely locally grown produce available to us. I try to savour each peach, tomato, berry and corn on the cob. Here and there I kept hearing Gayla Trail tweet about making pickles, buying canning jars and ‘putting up’ all kinds of fruits and vegetables. It hadn’t really occurred to me that preserving some of this fresh food will allow me to enjoy it in the cold winter months. I was over the moon when Gayla agreed to share her experience and teach a workshop on Canning Heirloom Tomatoes at the workroom. Firstly, Gayla is a fountain of incredible knowledge. Her book and website, You Grow Girl, have fostered a community of gardeners and provide endless inspiration. She is an amazing photographer (check out her ‘daily botanical‘), crafter and she lives right here, in Parkdale. To start off the workshop, Gayla laid out a beautiful collection of her preserves, pickles and syrups. Just seeing all the colourful possibilities laid out in glass jars was enough to get me dreaming of starting my own collection. We were even allowed to sample her peaches in brandy, oven roasted tomatoes in olive oil and cherries in red wine. So delicious! Then, it was down to work. Canning is definitely work. 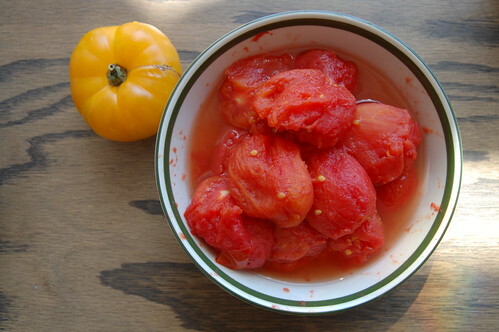 The jars need to be sterilized and the tomatoes need to be washed, scored, blanched, peeled and cored. Food preservation is pretty serious and safety is a major concern. As we worked on getting the tomatoes ready, we chatted and asked about a million questions. I felt that each of the students was like a sponge trying to soak up every word Gayla said. There was an article on Saturday in the Globe & Mail about the popularity of canning right now, featuring Gayla. She also has a new book coming out in February called “Grow Great Grub: Organic Food from Small Spaces“, just in time for us to plan our gardens for next year. She’ll be sharing some of her recipes, including her pickles. I’m crossing my fingers hoping she might want to teach a pickling workshop. I don’t think I can wait until February to learn more of her secrets. I’m addicted. I know for a fact that many of you are making delicious jams and pickles. Maybe you’ll share your trusted recipes? They look great and it sounds like a wonderful day! You can’t beat buying fruits/veggies that are locally grown. Yes, I read the article in the Globe. I was reading in while on the bus to visit my parents, where they were in the middle of their tomato-preserving extravaganza.You can check out the pic of their jumbo-sized boiler on my blog. The produce right now is fantastic! I headed down to the St. Lawrence Market on Saturday and got bell peppers, hot peppers, zucchini, yellow squash, tomatoes, and corn. It was so lovely. I would love to try canning or preserving, but I’d really like to have someone show me how it’s done rather than trying to learn from a book. Mmmmm looks amazing… I am so excited to make red pepper jelly and great fall goodies. 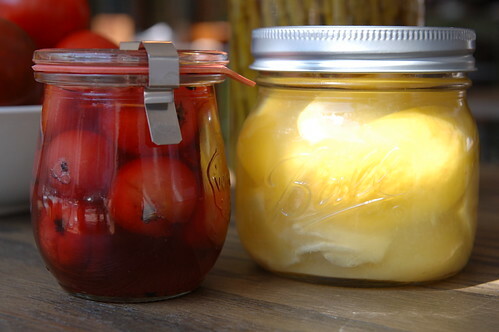 We’ve got some great preserving workshops going on through notfarfromthetree.org. In Ward 31 we’re using our donated share of our urban harvest to bulk up the cupboards of the Shoelace Collective’s lunch programme with yummy preserves. So far we’ve done apple pie filling, pears in syrup, ginger-pear preserve, salsas, chutneys, sauces…. To learn more about urban harvesting, to let us know about a tree near you that might need picking or to try out a little preserving of your own drop by the website and register as a volunteer then just watch your e-mail. Ooooh, look at those Weck jars! Jealous. I’m so jealous of you, attending all these classes on fascinating everyday subjects… I wish I could too! I’ve been wanting to try canning for so long but first I need to find myself a mentor… my granny is a city girl so she can’t help me! When’s the next class?!!!! I’m salivating over all the delicious fruits and veggies you’re discussing. Way to go canning ladies! Your photos & canned goods look so yummy! My sister & I recently took a Pickle-Canning Class and the gal that taught us had some DELICIOUS Dilly Beans that she’d canned previously, and let us taste-test. Oh my goodness, they were sooooo good! The recipe is in the Ball Blue Book…can’t wait to try some. How gorgeous! It’s so great having canned tomatoes for the long winter months! adele – it was a lot of fun! it’s true, local produce always tastes so much better. miss crowland – i might be obsessed enough to one day buy a pot as big as your parents! 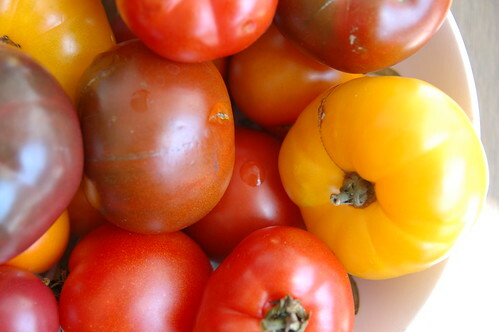 kaye – i wish i lived closer to st. lawrence market to shop for produce there. you should try to find someone you know who might be able to teach you and there are other places to take classes. check out katharine’s comment below. jen – hopefully kyle will make you some delicious canned food! 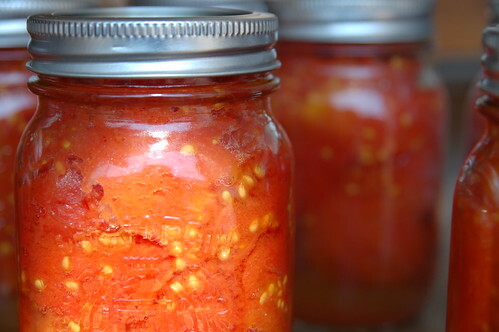 davis – do you have a good red pepper jelly recipe? this is something i would LOVE to make. katharine – thanks for letting everyone know about your organization. i heard about it last year and i think it’s wonderful! jen – the Weck jars belong to Gayla, so yes, i’m super jealous. i love glass jars. i’m going to have to order some on the internet! concha – i’m sure you know someone who can teach you. one day, i hope you will get to come to the workroom in person. it would be so fun to have you here!! alison – i’ll keep you posted if any other classes come up. 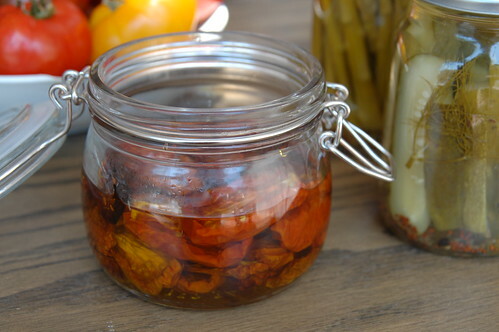 tami – your pickles look amazing. i hope to learn to do those next! suzanne – thanks for sharing the plum compote recipe. i’ll have to try it. i’m in love with your apricot jam. it’s so tart and delicious. i just had some this morning with rosemary focaccia! Ladies….in 2-3 weeks Weck jars will be avaiable in Toronto/Canada – no more expensive shipping charges….I just organised to be distributor…cannot wait! Do you have weck canning jars or do you know where I can buy them in Canada?